The second in the Sergeant Gunnhildur series by Quentin Bates builds in intensity to the point that, about halfway through and a bit beyond that, it's the best crime-novel evocation of the financial crash in Iceland (and beyond) while simultaneously taking on the Sjöwall/Wahlöö mantle of empathetic social criticism in crime fiction. Alas, the story is so complicated that the energy has dissipated somewhat before the end of the book, and the somewhat anticlimactic climax reinforces that drop-off. Nonetheless, it is overall a very interesting book. There are perhaps 4 threads to the book, the first being Gunnhildur herself: a flawed cop and mother, but not spectacularly or disastrously flawed, as is the case with a number of series characters. She is quite sympathetic, someone a reader might want to get to know, who is moving on with her life after the death of her husband and as her children grow up and out of the house. She's now working in a violent crimes unit in Reykjavik, where she is the da facto unit leader, in the absence of the official leader, and is thus at the mercy of some higher-ups (some of whom are actually effective police). She also returns to the small town of the first novel in the series, though, since she kept her house there, and both personal and professional events lead back there from time to time. The second thread is the death of a semi-celebrity, a fitness entrepreneur who has some other business going on on the side. She is beaten to death in her own apartment, and the investigation is the main thrust of the novel. The other two threads are in some ways more interesting (as Barbara Fister has remarked at her excellent Scandinavian Crime Fiction blog). 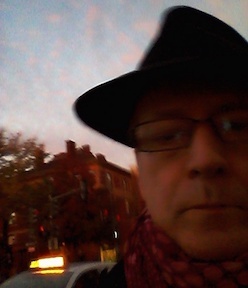 The most interesting is also the one that most suggests Sjöwall/Wahlöö, a man who has lost everything in the crash and blames a few individuals among the host of people (a number of whom feature in the novel in one way or another) who caused the misery but didn't experience the suffering themselves. This man is obviously on a collision course with those individuals and with the police. The final thread, though the one with which the book begins, deals with a nasty piece of work who inexplicably escapes from prison not long before he would have been paroled, and then goes on a violent spree, seemingly settling old scores with violent attacks. The way these threads intertwine and resolve themselves shares something with the casual and unexpected plotting of Elmore Leonard, mostly to good effect. There's not a sudden epiphany that brings everything together, Gunna (as she is mostly called) plods ahead in her investigation and tries to take advantage of unexpected developments in each of the investigations. The course of the novel is very involving but so complicated that a reader's attention may flag after that middle point that I mentioned. Part of the confusion is unfamiliar and similar-looking Icelandic names, so that some of the men implicated in the crash and in the fitness guru's life are a bit hard to keep separate as Gunna bounces back and forth among them in her investigation (though I suppose with the boom in crime fiction set in Iceland, we should be getting used to Icelandic names by now).. Overall, I think Frozen Assets, the first novel in the series, is a tighter and more coherent story, with an ending that is frustrating but not as anticlimactic. 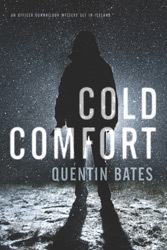 But Cold Comfort introduces some very interesting characters and develops the setting and stories of Gunna's environment in positive ways, leading me to look forward to the next Gunnhildur book with anticipation.